BE Grand Resort in Bohol celebrates its 1st anniversary by offering a value-filled promo that runs until December 20, 2016. This website-exclusive deal gives away free meals, F&B and spa discounts, complimentary transfers, and more. BE Grand Resort in Bohol celebrates its 1st anniversary by offering a value-filled promo that runs until December 20, 2016. This deal, which is exclusively available at http://www.begrandresort-bohol.com/offers/, gives away free meals, F&B and spa discounts, complimentary transfers, and more. - This deal cannot be used in conjunction with other promotional offers or discounts. - Unused portions of selected benefit are not transferable and will not be refunded to hotel bill. - All value-added benefits can be used once, per room, per stay. - The hotel reserves the right to offer alternative benefits should the one requested is unavailable. - In case of dispute, the hotel reserves the right to make the final decision. 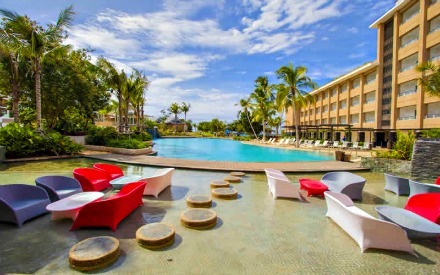 Interested parties can grab this anniversary promo by making a reservation at this resort in Panglao Island via http://www.begrandresort-bohol.com/offers/. They must click the "Check availability and prices" button below the promo banner to launch the online booking system powered by DirectWithHotels. Once in the reservation engine, guests should select a check-in date, choose available rooms for the promo, and provide the essential credit card information to submit their payment. Once done, an email confirming the booking will be sent. All transactions are monitored by Trustwave and DigiCert. Promo details may change without prior notice, but reservations made before any adjustment will still be honored. Presenting a secluded sanctuary in Panglao Island, this resort in Bohol boasts breathtaking ocean views, landscaped courtyard and lush gardens, diverse dining options, and unrivaled variety of recreational activities. What sets BE Resort Panglao apart from the other properties is its dive center and customized dive pool where you can have basic diving course with the aid of experienced instructors. A few sessions with them will prepare you for exciting underwater adventures in the islands of Balicasag, Cabilao, and Pamilacan where stunning coral reefs await your eyes. To know more about this Panglao Island resort, guests may log on http://www.begrandresort-bohol.com/.